A long yet informative page dedicated to everything content marketing. 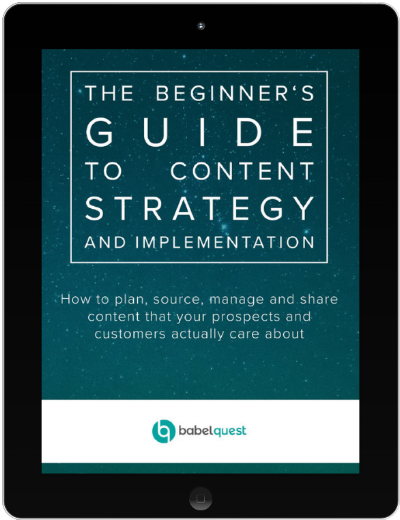 THE BEGINNER’S GUIDE TO CONTENT STRATEGY AND IMPLEMENTATION will help your team start creating content that actually delivers on its goals, month on month. The most successful marketing strategies spark meaningful conversations with new prospects. They build trust and foster familiarity. Through the practice of engaging in meaningful conversations with the right people, you build the relationships your business needs to grow. But it’s noisy out there, and attracting and connecting with your most valuable prospects is more challenging than ever. If you want to run a successful inbound strategy, you’re going to need content that speaks directly to them. Of all the elements that make up an inbound marketing approach, content is the glue holding everything together. Not only will your content be attracting and converting your prospects, but it can also assist your sales team in closing them. Let’s not forget how you’ll then delight those customers with valuable content about making the most of your services to turn them into referrers and repeat buyers. Anywhere between one to three million articles are published online every day. With so much content being produced, generic articles and average-quality video won't perform. Even good content will struggle to be seen. So how do you stand out from the crowd and speak to your target buyers? Your content strategy is the 'how', detailing the creation, distribution, promotion, and management of your content. It will focus on your customers’ key goals and challenges and how you use a variety of content forms — such as written assets, infographics, and video — to address their needs. The insights provided by your content strategy will also help you to evaluate the effectiveness of your landing pages and broader website copy. Have you really explained what your business does? Do you have enough supporting information available (and accessible) that a new site visitor can understand what you do, how you can help them — and why they should choose you over your competition? To generate leads that close you need a content marketing framework made up of detailed and informative content on the topics your buyers are searching for. The content on your website can (and should) be used to support your visitors throughout their buying journey. This means it’s incredibly important to make sure the user journey is optimised as much as possible by ensuring that your website is easy to navigate and that information can be found quickly. A solid content marketing framework makes sure you don’t start creating content that is never going to appear in search results or generate your goals. Google's latest shift in their algorithms is towards a framework favouring topic-based content. It's no longer looking at keywords in isolation but how all your content forms topic clusters. Linking relevant content together shows the search engine you have authority on a subject. Over time, you should rank higher and higher for the topic it covers. It effectively weaves your content together and creates a site architecture that is easy to crawl. Topics are formed of pillar pages and cluster content (or subtopics, as we like to call them), long-tail keywords directly relating to the main topic. HubSpot calls these topic clusters. Pillar pages are web pages that are designed to give you a comprehensive overview of each of the subtopics that surround your main topic. They should also have a clear conversion point, guiding visitors in the right direction towards becoming a lead. The subtopics are articles that go into much greater depth by look specifically at one element of the main topic. For example, if our pillar page was about inbound marketing, one of our subtopics might be marketing automation. By linking up all your relevant content (articles, web pages, landing pages etc.) you are showing Google that you know what you’re talking about and that you do this better than anyone else. Google will reward you with the overall authority of that topic, and by having a well-connected website, it will make it much easier for the search engine to crawl, which will also help to boost your search rankings. 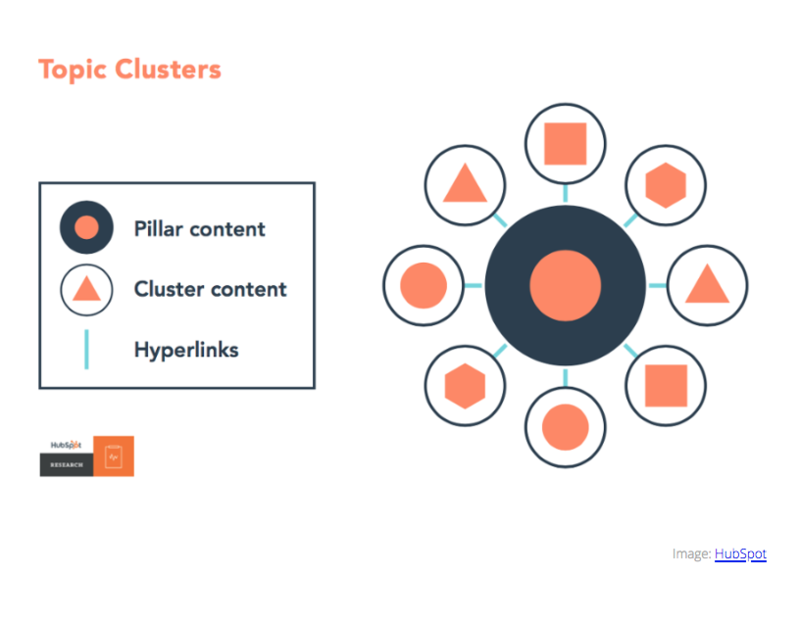 Here's a step-by-step guide on how to create topic clusters and boost your organic ranking. To generate leads that close, you need standout content. The secret? Leverage content marketing blog ideas, inspiration, and expertise from across the business. Getting buy-in for content and inbound marketing is often a challenge for businesses, particularly large corporates. By encouraging different teams, departments, and business units to brainstorm and share new content ideas, you involve them in the creation process from day one. Leveraging content marketing blog ideas and inspiration from these departments will allow you to be transparent about your business in the content you produce, demonstrating authority and helping you to build trust with each reader. You’re trying to start a conversation with your target buyer. And while you focus your time on the broader themes of increasing web presence, your consumers are becoming more and more discerning about the type of content they engage with. Before you even think about starting to create that content, you need to understand who it is you’re creating it for. The first step to generating leads that close is paying attention to your audiences. If you can answer a prospect’s concerns about your products or services in a clear and impactful way before they have even connected with a member of your sales team, it’s much more likely they will become a lead that closes. Read this article to get content ideas that actually work and learn how to run your own successful content workshop. Stories excite us in ways that facts and statistics can’t and that's incredibly powerful, especially when you've got your content cap on. I want you to think back to the last time you heard a story. I’m willing to bet it was today. We hear them on the radio when driving to work in the morning; we tell them at the office first thing on a Monday; we read them in the papers or on our phones at lunch; we watch them in the evening when we crash on the sofa. They’re on the backs of cereal packets and the front of billboards, they’re under our beds at night and in our sleeping heads. Stories are how people make sense of themselves and the world around them, giving context and meaning to information that would otherwise be forgotten hours, minutes, or seconds later. They can be told across a variety of forms, from articles and case stories to engaging videos. Most importantly, in my opinion, they appeal to our emotions, and for this reason if nothing else they belong in all areas of marketing. While for many salespeople and marketers storytelling comes naturally, for others it’s unexplored territory. The problem? Telling a good story is hard, and most of us are out of practice. We invest years getting our heads down for MBAs. We spend twice that ‘in the field’, obsessing over KPIs and metrics and planning and meetings and who is delivering this report and why did no one reply to that email and where are the coffee pods? We sit in siloed departments and break down businesses into revenue streams and forecast figures used to populate vast spreadsheets, all because we need to tick off a task before we dash off at five to catch the bus/beat the traffic/hit the pub and we lose sight of the bigger picture. What does the customer want? How can your business help them get there? And what are the stories that bring this relationship to life? Learn how to tell stories and use the power of storytelling in your content. Storytelling is a muscle, and like a muscle it needs to be worked regularly to grow bigger and stronger. For most of us, sitting at our desks every day, this muscle withers. It shrinks. A tiny little mouse muscle. But with practice, you can quickly and easily get it up to size again. Digital marketing today — particularly inbound marketing — hinges on your ability to engage with the reader. To help, I’ve reached out to nine people spanning content marketers, storytellers and good ol’ fashioned novelists with a penchant for telling a good tale. These people make a living telling stories that change lives, move minds, and grow businesses every day. I’ve learned from them just putting this post together. You can learn from them too. You’ll notice that in the first few pages of a novel we often learn what a character has lost and what it is they long for. Writers need to spend a lot of time thinking about their characters, each character’s history, and very importantly, the things that each character longs for. Kurt Vonnegut said that every character should want something, even if it's just a glass of water. When I’m writing a story I usually start with a character and the story grows from that person. Rebecca Smith is a principal teaching fellow in English and Creative Writing at the University of Southampton. She is the author of The Jane Austen Writers’ Club, three novels also published by Bloomsbury, and most recently, a picture book, Where’s Jane? Nobody cares about your corporate message. Find a way to connect with your audience and cut through. For me, it's about putting customers at the centre of the story, using customer insights to make them the hero. The product is simply the magical gift that empowers them to do amazing things. Victoria Oakes is the storytelling and digital destinations lead at Microsoft UK. She has recently co-created The Little Book of Storytelling, an easy-to-digest book on how to use storytelling in your role, with inspiration and tips on honing the craft. One of the most important parts of brand storytelling is determining what your prospects actually want and need content about. So many brands feel the need to make content for content's sake, and wind up creating content that their prospects and customers don't find helpful. If you start with your audience — understanding what their challenges are, what they want, what they need — you can create content that actually resonates with them and ultimately better serves your business goals. Melanie Deziel is the founder of StoryFuel and a lifelong storyteller. She was the first editor of branded content at The New York Times, where she wrote the native ads that won the Best Native Advertising Execution OMMA Award in both 2014 and 2015. Read the rest of the tips for free in our article on the art of business storytelling. There’s a strong chance your content is already generating leads that close. A content audit will highlight this, giving you visibility over your most valuable assets. The importance of consistent messaging across channels can't be overstated, giving prospects a clear picture of who you are and why you're relevant to them. There will be some content in your business already. You may have created some articles, white papers, or case studies and that’s only looking at the online content — what about the brochures and collateral being used by the sales team? Get clear visibility of the content already in your business to understand what is missing, what should be binned and what could be repurposed. Ultimately, save time and resources by not having to start from scratch. First, create a spreadsheet to keep track of everything. We’ll go through all of the columns you’ll need throughout this article but start off with the name. If you have customer testimonials, you might want to track these in a separate tab in your spreadsheet. They will act as a really useful resource when you are creating content in the future. A full content audit can seem like a challenging task, particularly when some of that content might be hidden in the inbox of the sales department, but honestly, it will be worth the time when your content starts delivering leads that actually close. We outline all the steps you need to do a content audit for your business and make a plan of action for how to tackle each piece. You’re writing more like a publisher, but are you running like one? Defining a content marketing editorial process is often the content team’s biggest challenge. ‘Timely’ and ‘efficient’ are not two words that come to this process naturally, especially during the early stages. Businesses are realising they need to start acting more likely publishers with regards to the content they produce but forgetting that this comes with processes of its own that must be followed and adhered to if the content production stage is going to prove cost-effective and sustainable. An editor is central to this process. Whether that's your head of content, a brand manager, or someone in a senior copywriting role, this person sits at the core of the editorial process and is responsible for ensuring that your content marketing strategy is delivered a) on time b) on budget and c) to the quality standards necessary for your strategy to work. We're talking consistency, predictability, and repeatability here. Here's the thing: pretty much everything about content creation is hard. If it was easy, everyone would be doing it well. Who is devising the content strategy in the first place? Who is responsible for sourcing the stories your content needs to engage and affect your readers? Who is accountable for making sure the calendar is followed and that content is delivered on time? Who is the gatekeeper, ensuring all the content adheres to your company voice and other brand guidelines? Who is capable of editing the articles and videos delivered to bring them in line with these guidelines? Who is monitoring the content's performance and optimising the relevant pieces accordingly? Who is iterating the strategy going forward to reflect ad-hoc changes and wider shifts in strategic direction? And finally, if multiple people are carrying out the above duties, who is working with them to make sure all parties are on the same page? This is one area where working in partnership with an agency like ours can make a significant difference. With a dedicated team of writers and editors to support your content requirements, you can go to work each day confident that your content marketing strategy — and the editorial process that drives it forward — is in safe hands. In order to keep up with their fast-paced publishing cycles, newspapers and magazines keep an editorial calendar of who is writing what — and when. Using this editorial calendar, editors can know what’s coming up well in advance, ensuring a smoother and more organised publishing process. Imagine how chaotic the content production process would be without it: a scramble for subject matter, editorial approval, missed deadlines, and late or poorly written articles. It's an editor's nightmare. 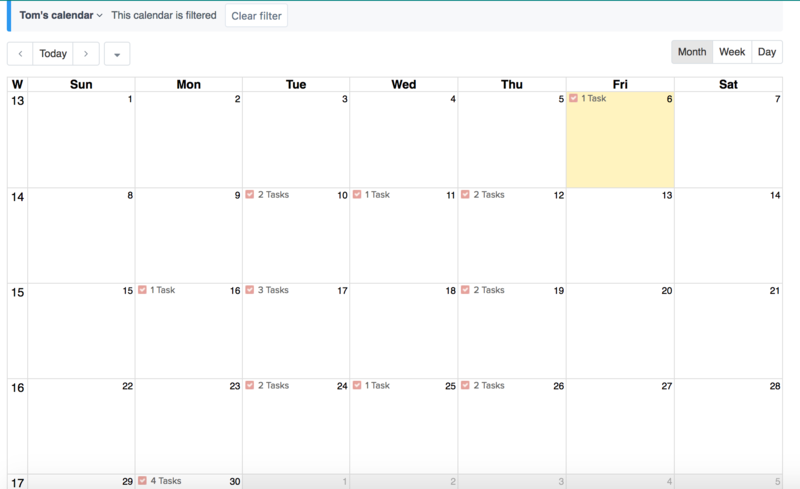 A clear, easy-to-use content calendar works in the same way. Read our article on content marketing tips for small businesses to learn step-by-step how to create one. Look for the social media sites and forums where your target buyers spend their time and set about sharing useful, relevant content with them there. The secret of worthwhile social media distribution is taking the time to understand where your target buyers visit online and what works best on the various platforms. You could just share all your content across all channels, but you’ll get better results (and save a lot of time) if you take a more strategic approach. You can find these places by searching for them (not just via Google, but also through Reddit, Google+, Facebook, Quora and LinkedIn). Instagram has high rates of user engagement with brands, but with 90% of its users under 35, this platform is best used if your target audience fits into this demographic. You can pay to promote your content and there's a range of targeting options, including by job title. An obvious but-still-worth-mentioning-point is that Instagram works best when your company has a well-defined visual identity. Facebook is currently the most cost-effective channel, allows narrow targeting, and currently boasts the most sophisticated AI capabilities, but do some research first to make sure it is relevant to your sector, as it is still perceived by many as one of the more informal platforms. There's a lot to know about getting content distribution right on LinkedIn. One feature that needs a special mention here though is the site’s SlideShare tool, which is great for packaging up content in an accessible, easy-to-digest format. Twitter is a competitive platform, because of its high-volume low-value traffic. Your posts disappear fast — with a median lifespan of 18 minutes according to Moz. That might make you want to reuse each tweet multiple times, but your audience will pay more attention if you keep them fresh. Other options where your audience might be found include online magazines, blogs, or specialist forums. Learn more about promoting the content to the prospects you haven't met yet. An effective content strategy is the foundation of successful inbound sales and marketing operations. Content strategy is about communicating to prospects by providing useful and relevant articles and videos that attract them to your site and convert them into customers you can really help. A mature content strategy can even support you with retaining your customers and growing their accounts (great if you've been wondering how to improve customer service and get more referrals). This is why content lends itself so well to the inbound methodology: it's centred around your audience, what they value, and how you can use your content to help educate them. When you provide useful information through content, trust is built — which in turn informs their purchasing decisions, especially when you consider the fundamental role content plays today across marketing, sales, and service delivery. Discover how in our free beginner's guide to planning and implementing your company's content strategy. The only way to optimise your content's performance? Testing and iteration. Back in 2015, HubSpot carried out a test revealing that 92% of their monthly blog leads were coming from historic posts. Even more interesting, they found that 46% of their monthly leads came from just 30 individual posts. For a company that was, at the time, publishing nearly 200 new posts every month, this must have been quite an eye-opener. By taking time to step back and look at the figures, HubSpot identified areas of focus, like improving the conversion point on high-traffic, low converting posts and increasing traffic to posts which were already converting well. By adding the schedule for updating posts to their editorial calendar they were still creating new, timely articles but were also able to improve the overall performance of the blog. If you’re a HubSpot user, there really is no reason why you shouldn’t already be carrying out content optimisation on a frequent basis. Take a look at some of the key tips for making use of your data to start optimising today. 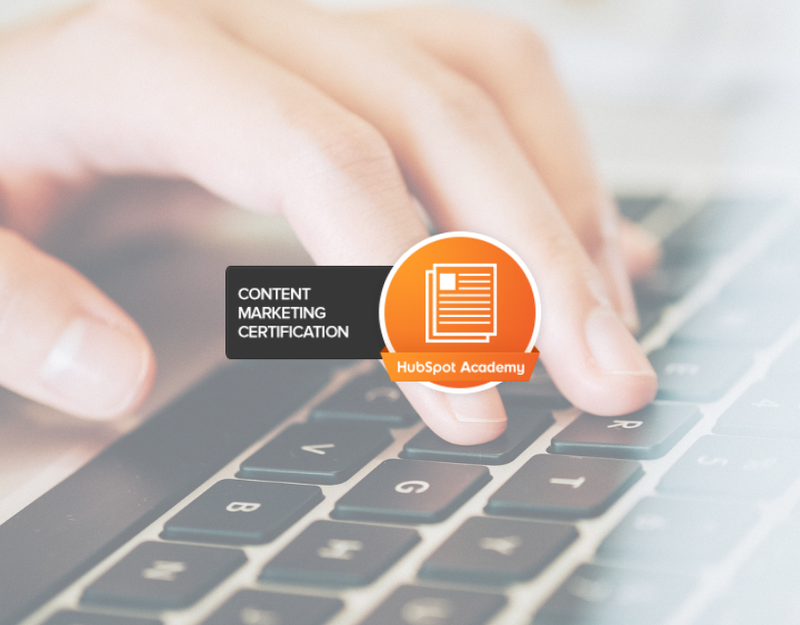 HubSpot’s Content Marketing certification equips you with the knowledge and tools needed to successfully implement your inbound marketing strategy. From idea generation to storytelling and repurposing to promotion, this certification provides the perfect foundation for creating phenomenal content that attracts, educates, and closes your target customers. You’ll recognise by now that meaningful conversations aren’t possible without a clear understanding of how to plan, source, manage, and share the stories that genuinely resonate with your target buyers. We hope this page helps you to define these key steps, bringing your content strategy to life and helping you to drive predictable, scalable, repeatable growth, month on month. For more in-depth information on some of the topics covered here, download 'The Beginner's Guide to Content Strategy and Implementation', offering a deeper look at the steps you need to set up and implement a content strategy in your own business.